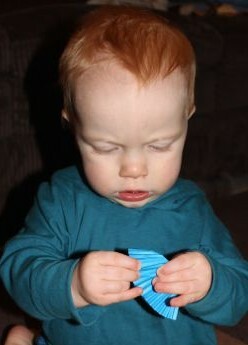 Now that Baby T is getting older, I have been thinking of ways to get him more involved with out activities. Sensory tubs seem like a great start for him. I made up a very simple tub using blue items. 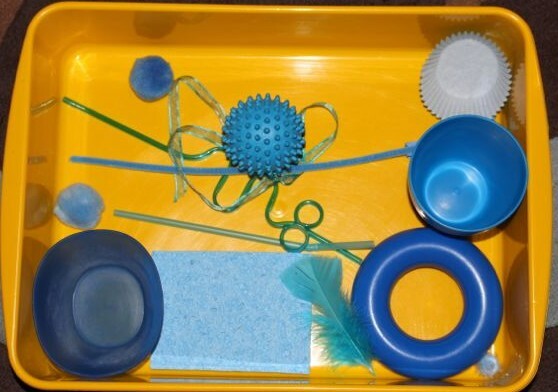 I found a range of blue things from around the house, including a peg, ribbon, pom poms, straws, cup and a spiky dryer ball. Putting the straw into the cup. Baby T was very interested in the tub, and straight away pulled out the cup and curly straw. He spent a lot of time investigating the straw from all angles, and putting it into and out of the cup. 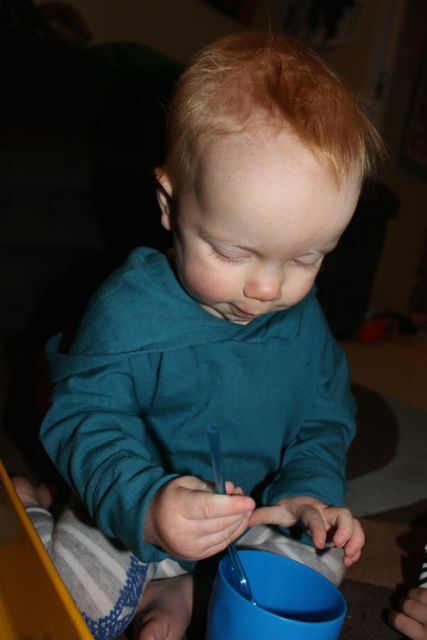 He also put the end of the straw into his mouth just like his sisters do. The pom poms were also popular, though he tried to put them into his mouth a lot. He licked all the pom poms a number of times too, I suppose their furriness was interesting on his tongue. L tickled Baby T all over with the feather, making him laugh. He was particularly ticklish on the bottom of his feet, and around his ears. The feather also went in his mouth, as did almost everything in the tub. He even tried to bite a piece out of the sponge. 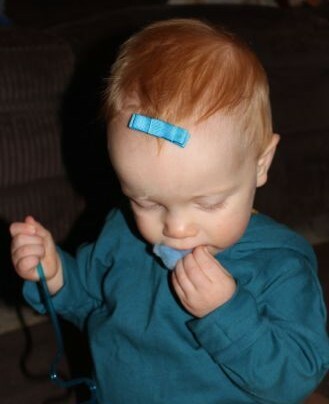 L put the blue clip into his hair, but he didn’t notice, he was too busy putting the smaller items into the cup and the bowl. He crunched up the muffin case, seemingly enjoying the sound that it made. We let Baby T lead this activity. Throughout it we named each item he picked up, and described it. We talked about the colour blue, the textures and sizes of the items, as well as their uses. He spent much longer exploring this tub than I thought he might, he was extremely interested, and very happy with the contents of the tub. We will be doing more sensory tubs for him soon.